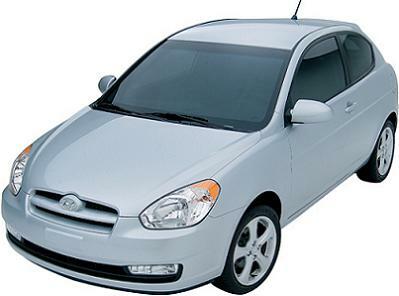 We don't think we've bought half a car for the price Hyundai's going to be selling their 2007 Accent. The 3-door version of this bargain-bin priced ride will be $10,415. We've got pricing on the other packages as well and you can see the pricing for the rest below — but don't expect anything that'll make or break your wallet. Also, don't expect anything that'll make you look very stylish either — cause this four-cyclinder, 1.6 liter DOHC CVVT inline-powered car ain't gonna be the car that'll make the ladies scream — well...maybe with laughter.